Home / beauty / Beauty Review / skincare / Can These SheaMoisture Products Help Oily Skin? Can These SheaMoisture Products Help Oily Skin? If you’ve been following me on Instagram you’ve gotten a glimpse of my battle with oily skin and enlarged pores. I’ve always had oily skin. In fact, it’s a trait I inherited from my mother’s side of the family. As I’ve gotten older my skin has started to shift into more of the combination space with a good dose of oil. So I’ve been changing up my skincare routine and using different skin and makeup products to help lessen the amount of oil, shine, and pore sightings that happen throughout the day. Two of the products I’ve been using are from the SheaMoisture African Black Soap and Bamboo Charcoal line (Whew! Have you noticed that SheaMoisture has long names for their products?) The products are the Detoxifying Foaming Face Wash and the Gelee Moisturizer. I love testing new beauty products, especially ones that are formulated for my skin type and have the potential to help address products I may be having. So I’ve been giving both a whirl now for a few weeks. 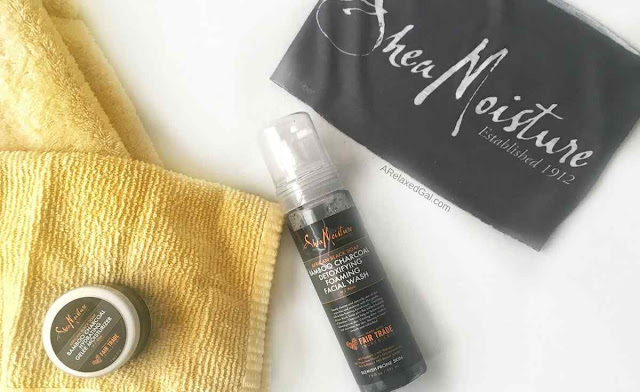 The SheaMoisture African Black Soap and Bamboo Charcoal Detoxifying Foaming Face Wash has a trio of great ingredients in the African Black Soap Bamboo Charcoal and Aloe that are meant to help oil and blemish-prone skin. The African Black Soap is supposed to help with clarifying and deep cleaning. The Bamboo Charcoal detoxifying by absorbing oil and impurities and the Aloe helps to soothe and nourish the skin. After using this face wash a few times I've noticed that it does seem to be working. My skin doesn’t quickly oil up after using it. And my skin does feel refreshed, clean, but not dry. I've also noticed that pimples that looked like they were developing would start shrinkings and eventually go away. 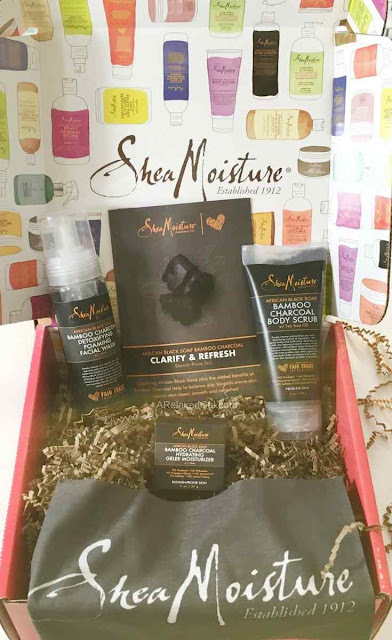 The SheaMoisture African Black Soap and Bamboo Charcoal Gelee Moisturizer was a bit of surprise for me when I opened it. I don’t know what I was expecting from a moisturizer with charcoal, but I was a bit surprised by the color and more liquidy texture (in fact I almost spilled half the jar on my couch!). The Gelee Moisturizer has similar ingredients as the Foaming Face Wash - African Black Soap, Bamboo Charcoal, and Aloe. It quickly absorbs into my skin and doesn’t make my face look greasy. Also, my skin feels refreshed. It did tingle the first time I used it but it wasn’t a bad or uncomfortable tingle. While I have noticed some decent results after using both products there are a few things about each that I don’t care for. The pump for the foaming face wash isn’t good. After a few pumps, it got stuck in the down position which caused a mess whenever I would shake it to activate the charcoal. It also makes getting the product out difficult. I have to wash my face twice to make sure my pores are clean. The first couple of times I used it I removed my makeup with a makeup wipe and then washed my face with the Detoxifying Foaming Cleanser. Then I used my homemade toner. When using my toner I realized that I was using almost twice as many cotton balls as I had when I was using another deep facial cleanser. The moisturizer doesn’t have any SPF. I cannot and will not wear a moisturizer throughout the day that doesn’t help protect my face from the sun. As a result, I’m only wearing this moisturizer at night. The moisturizer isn’t that moisturizing. After applying parts of my face feel a little dry which could be because of my combo skin. So I started to apply my regular nighttime moisturizer on top. While I’m not a true converter yet, I have seen some decent results that seem to be keeping my oily skin in check. So, I'll continue using both products until I’ve used them both up. So be sure to follow me on Instagram to get my thoughts as I continue using these products on a daily basis. What's your go-to face wash or moisturizer for oily or combination skin?